Star Wars fans REJOICE! This post will be littered with Jedi references. For those of you who haven’t seen Star Wars…where the F**K have you been?! Instagram and the fountain pen community have been awash with Chinese wonder pens recently, and I jumped on the Deathstar to be part of the crew. For less than the price of a can of Coke, you can pick up a Jinhao 992 from eBay; and for less than a cinema ticket, a Delike New Moon. No Jedi mind tricks here: that is the truth, Obi Wan. Naturally, we’re all dubious about the quality when someone tells us about lightsabers that don’t cost many space credits. But these cheeky Ewoks are incredible! Amazing build, decent nibs and insane value. Let’s take a peek. Bobba Fett- Jinhao 992, eBay 99p! The Jinhao 992 is the Bobba Fett of the stationery world – suave, underrated and…has a cool helmet? I don’t know, I just like Bobba. I picked up these Jinhao for a steal on eBay – 99p and free shipping from China, and they only took two weeks to arrive! I have heard of people buying an entire tray of them for less than a tenner which is crazier than Jar Jar Binks on meth. They come in a range of demonstrator colours, but I went for the most unusual Jabba the Hutt green and Tatooine sand brown. Nice! Whilst it doesn’t come dressed in a nice Stormtrooper suit for packaging (a simple plastic sleeve actually), the pen itself is sturdily built. The plastic pieces and threads fit together well, and the metal clips and cap band look waaaaayyyy more expensive than a measily 99 Jedi mini-coins. Next to my Sailor Pro Gear Slim (sadly lost to the Dark Side…known as ‘sold’! ), they did not look out of place. I’ve been most impressed with the supplied converters – easy to fill, snugly fit into the pen and work better than proprietary versions from other brands. There is potential to eyedropper, but I’ve only seen unsuccessful attempts on Instagram as plugging up the tiny hole at the bottom is difficult. Still, if you aren’t afraid of Jabba juice squirting all over you, then go for it! I am pleasantly surprised with the pretty scrollwork and performance of this nib from the word go. Without any tuning or tinkering, the nib writes a wet, smooth and consistent F/M line with no skipping. I can’t even get one of my higher-end Pilots to do that! No flexy fun here, but for 99p what do you expect? It is also prettier than Princess Leia; again, something that more expensive pens lack. Jedi or Sith? – Worth Buying? This is a stellar Jedi Knight fo’sho’. I am blown away by the build and performance of such a cheap pen. It writes better than a pen over £100 in my collection (not going to name names…), looks fierce and is STUPID MONEY. Even if you hate it, you’ve only blown 0.99 galactic creds on it so it is worth a punt. I urge you all to go and buy an entire tray! You won’t regret it, wookie. Jedi Vs The Dark Side: who will be triumphant?! Will the New Moon be (De)liked? Darth was more nicely dressed than his Jinhao counterparts – a smart cardboard box that wouldn’t look amiss housing a £50 pen! It also comes with its own converter. The Delike doesn’t feel as well put together as its cheaper Jedi cousins; the threads and plastic parts are rougher, and the metal clip, cap and body bands don’t feel as flush either. 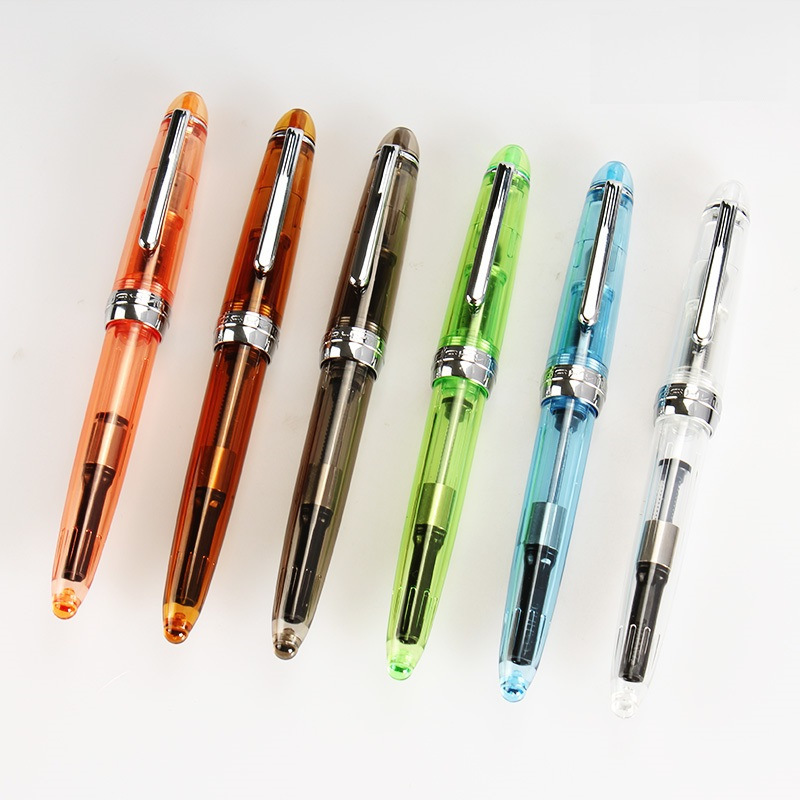 That said, it is a nice looking pen with more than a passing resemblance to a Sailor Pro Gear Slim; and comes in a range of hot looking colours that mimic resin. The force is strong in this one. This nib is the marmite of the galaxy. On one hand it looks like its been cut with rough pliers in woodworking class, and writes with a bit of feedback too. BUT, it writes a very fine line, feels like a Sailor nib (if it was a tenner obviously), and somehow is my daily carry most of the time! The nib works well on most paper, and because it is so cheap, I’m not afraid to throw it in my space pack when nipping off to Endor. It isn’t as smooth or fit as the Jinhao nibs but is still a great workhorse nib. If I had to choose between the Jinhaos and the New Moon, I’d say buy a buttload of Jinhaos for the price of one of these. Their build and nibs are intergalactically better for a fraction of the mullah. HOWEVER, the Delike is still a fab pen for the price, and if you want people to double take whether you have a Sailor or not, then you need one of these in your life! Cheap pens are bloody brilliant! I have sold many of my higher end pens and kept these as they are just so damn usable. There is debate over whether the Chinese invasion is ‘fair’ due to the pens being obvious rip offs of other brands, but if they write this well for this cheap, I’m going to be a naughty sarlaac and say ‘I DON’T CARE!’. Would you punch Han Solo in the face for a Jinhao OR a Delike?! Nice read, thank you for the review. I kinda regret buying DeLike, it’s not expensive, but I feel like I should have used that money for buying the real thing. Next Post Where ‘Av You Been?! : Nib & Muck Etsy Shop!